I always feel a bit sorry for Eriswell. Here it sits, squeezed between two of the largest American airbases in Europe, and neither of them are named after it. In addition, its once peaceful village high street is now the main road between Lakenheath and the A11, so traffic tears along it, and makes it all appear a bit shabby I'm afraid. 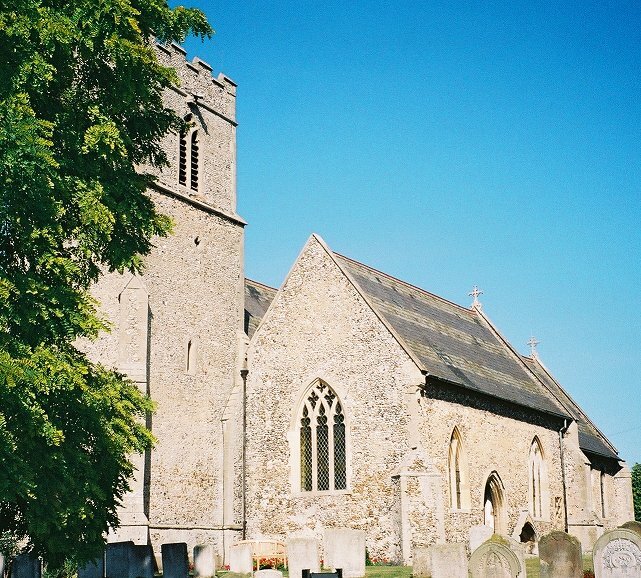 There's a pub, and some old cottages, and of course there is the church - but this is hardly the place you'd suggest as a typical old English village if someone asked you, an American for instance. I wasn't terribly happy about the cars storming past me, so I bumped my bike up onto the pathway, but it was covered in sharp stones, so I feared for my tyres. In the end, I resorted to pushing my bike, and soon reached St Lawrence behind its wall. 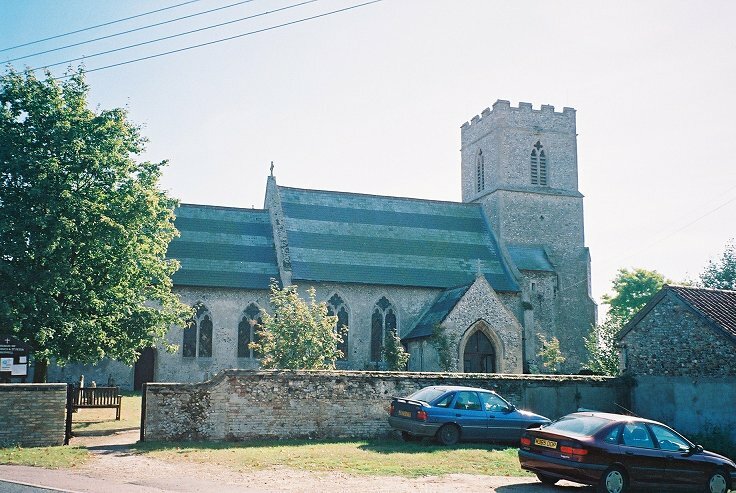 Unusually, the church has three doors all still in use; you enter the north door from the road, but it is the south door which leads into the original church. 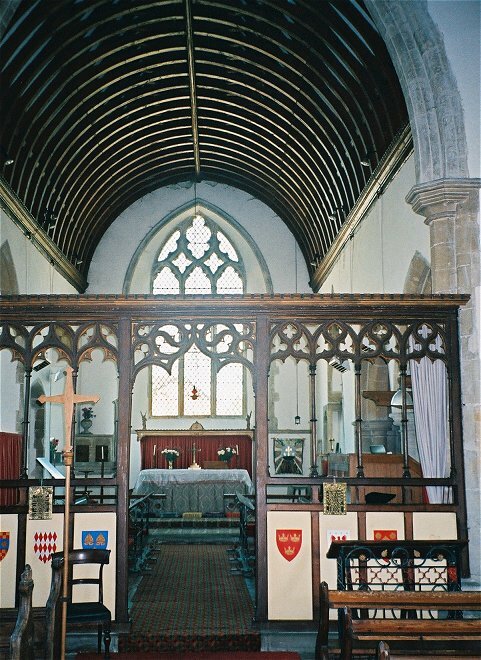 This was built in the 13th century, on the site of a Norman predecessor, and now forms the south aisle of the later church which followed 150 years later, when the current tower, nave and chancel were built. 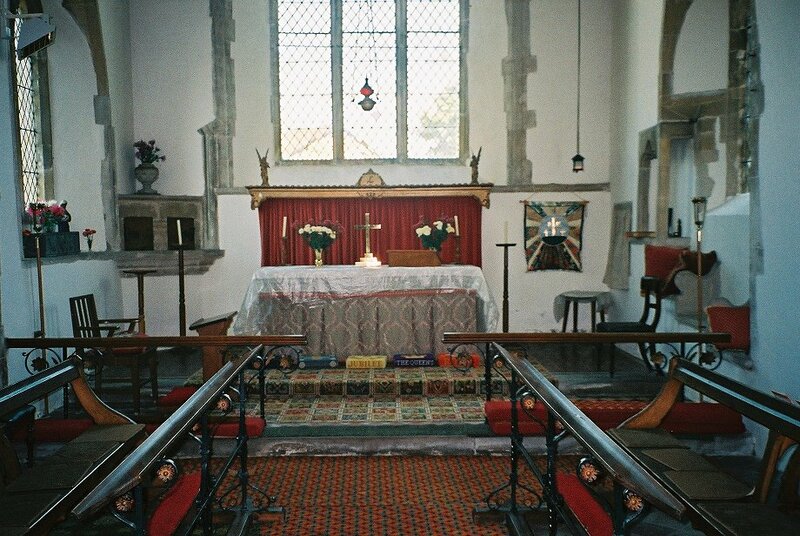 St Lawrence was, in fact, merely a chapel of ease to the parish church of St Peter, which was two miles to the north beside Eriswell Hall. The settlement around St Lawrence was the hamlet of Coclesworth, but in the later Middle Ages it became the larger of the two, and St Peter fell into disuse. You can still see its remains at the southern end of Lakenheath high street. 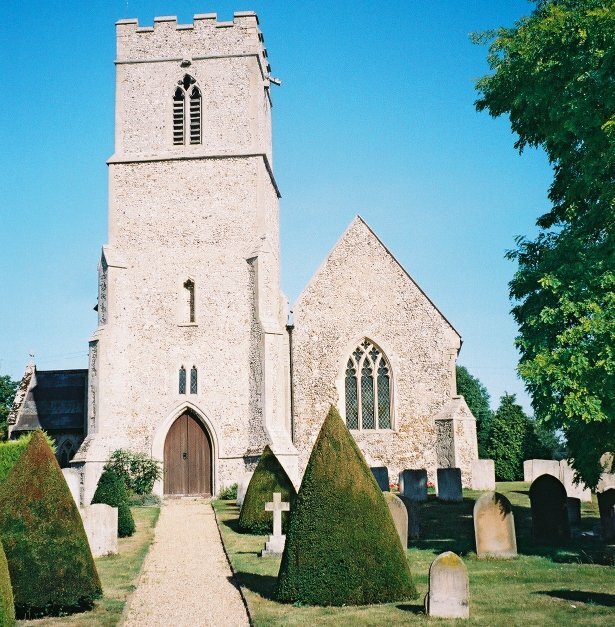 The people at St Lawrence were very nice on Bike Ride day, although the church itself was in a bit of a state because the organ had been completely dismantled. Organs take a while to acclimatise when you start messing them about (I had seen the same thing at Eye a few weeks earlier) but because the bits were piled on the benches in the south aisle I wasn't able to hunt down the graffiti spotted by Mortlock and Arthur Mee. These are rather graphic images of the two murderers hung in the village in 1792. A pity really, as I had rather been looking forward to seeing them, and I know you'd have loved to have seen the photos. I must go back. 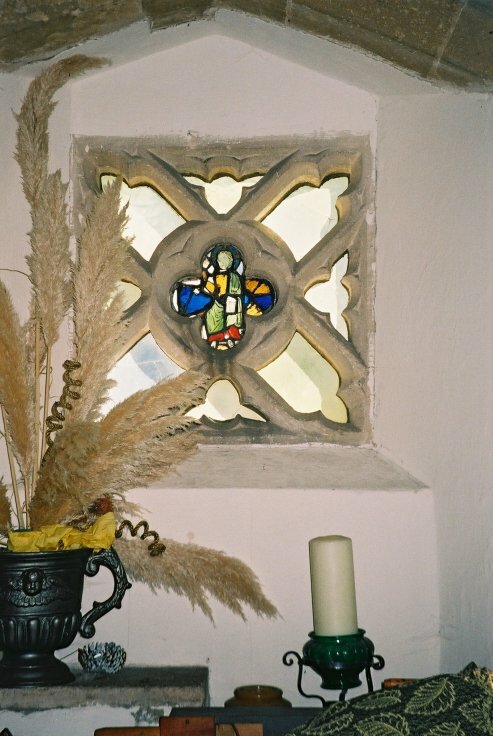 When the new church was built, the south ailse had a new window set in it to light an altar there. 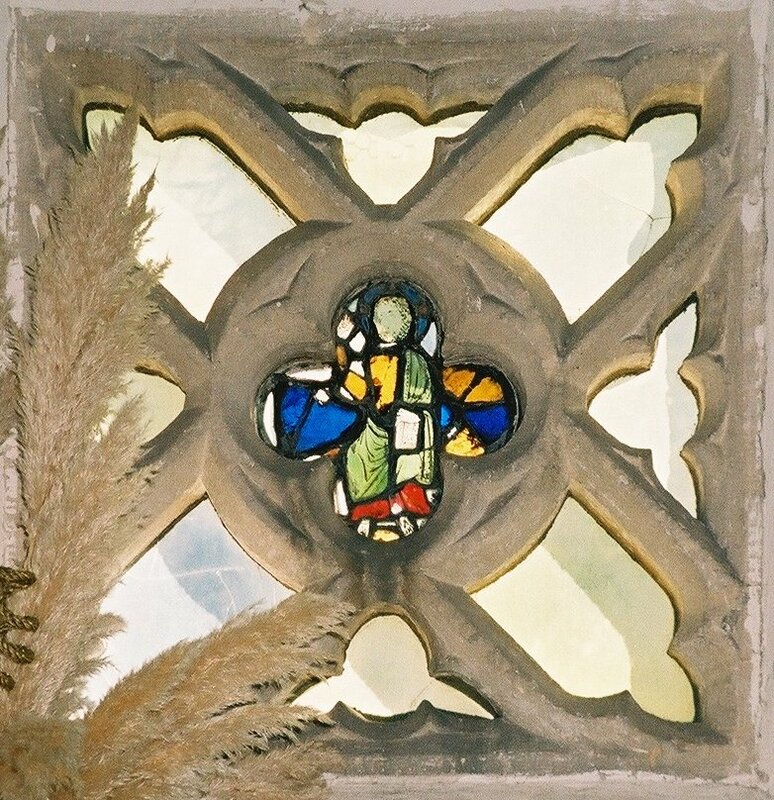 This is a delight, being filled with symmetrical tracery at the heart of which is a quatrefoil with a medieval glass figure set in it. 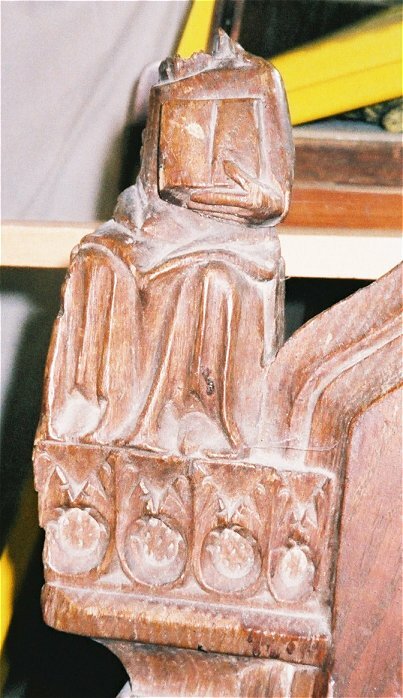 Mortlock says that the body is 14th century and the face 13th century. Presumably the Victorians put it there. At the back of the church is what looks like a junk shop, presumably a collection of items displaced by the organ. 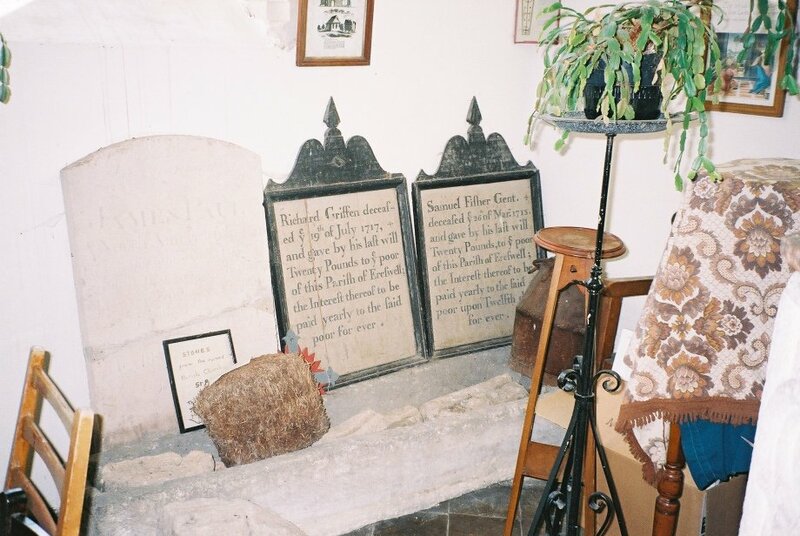 Among them is a reed hassock (there are more nearby at Icklingham and Lakenheath), a stone coffin, and a rather unusual tombstone. 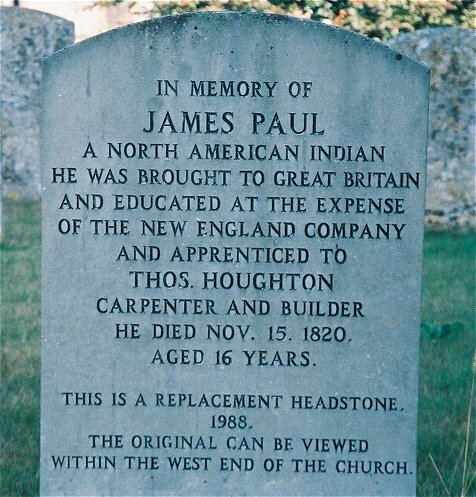 It is for a native American, and it reads: In memory of James Paul who was brought to Great Britain and educated at the expense of the New England Company and apprenticed to Thos. Houghton Carpenter and Builder he died Nov. 15 1820 aged 16 years. It was still in the graveyard until the 1980s, but has now been replaced by a new stone that bears the same inscription. The New England Company was a missionary society which paid for its activities from rents received from the Eriswell estate, which it had been given by Oliver Cromwell after he had stolen it from the Royalist Bedingfield family during the Commonwealth. Their mission was to propogate the protestant Gospel in North America, so it is ironic that this colonial institution was bought out by Maharaja Duleep Singh of Elveden in the 1860s. The estate was later inherited by the Guinness family when they in turn bought Elveden. Still, on several of the cottages on the busy high street you can see the letters NEC.